Spring is here, and it’s time to pump out the seafood dishes! Living in NYC I do not get to eat Crawfish aka “Mudbugs” a lot here. 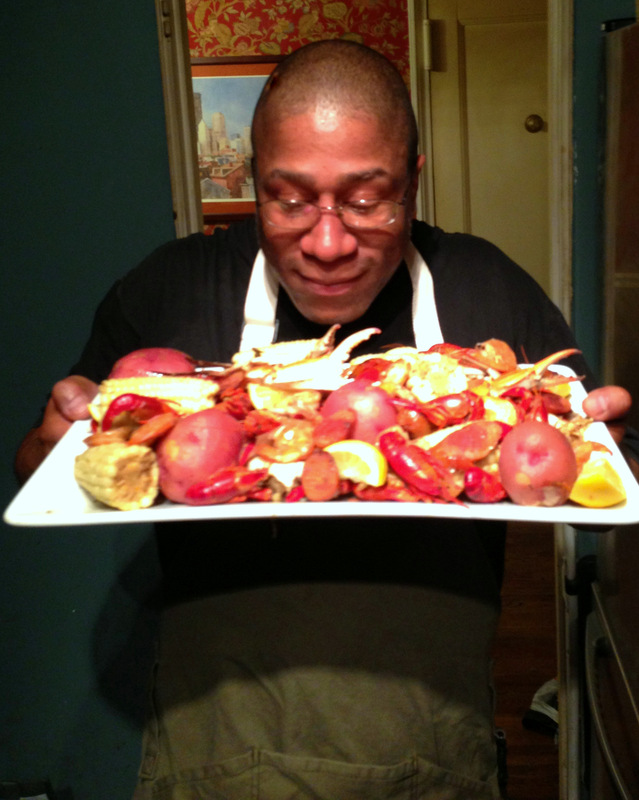 After a trip to Louisiana a few years back, I have come to love these fresh water crustaceans. Recently I found some at my local market and decided to do a tasty seafood boil. My girlfriend Emily and I just returned from Memphis,TN, after attending the 3 day Beale Street music festival. It was a weekend filled with great music and food…lots of food. We even drove down to Clarksdale MS and ended up at the famous Abe’s BBQ, which boast some of the best ribs in the Delta. We consumed so much barbecue and fried food that upon returning to New York; we decided that we should take a break from eating red meat and fried foods for a little while. So we have been eating seafood and veggies since arriving home; which really isn’t a problem. You see, I have a love affair with cooking and eating seafood. I just wonder how long it will be before I start to crave a juicy steak…wish me luck! 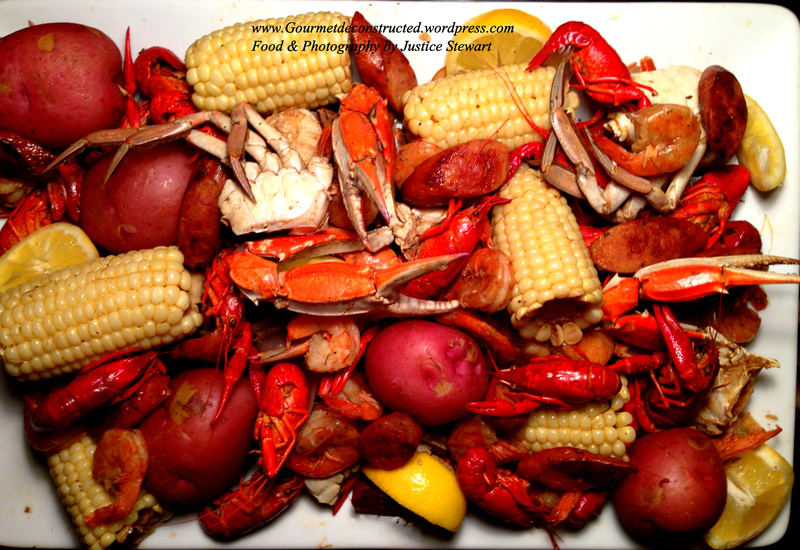 Enjoy the recipe for this spicy boil, Bon Appetit! Pour 2 gallons of cold water into a large stockpot. Add the garlic, onions, halved lemons, creole seasoning, old bay, cayenne, Worcestershire,corn, and potatoes to the stockpot; Bring to a boil.Reduce heat to medium and simmer until potatoes are just tender about 12-15 minutes. While the potatoes cook, heat up a heavy bottomed skillet with 1 tablespoon of olive oil and cook the sausage slices until browned on both sides. Add the crab, shrimp, crawfish, and sausage to the stockpot; cook covered until seafood is cooked through, about 7-10 minutes more. Drain the liquid from the pot and discard the lemon halves. Transfer potatoes, corn, seafood, sausage, onions, and celery to a serving platter. Garnish with the remaining lemon wedges and serve with cocktail/hot sauce. Posted on May 12, 2013, in Seafood and tagged Andouille sausage, bayou food, beale street music festival, blue claw, Cajun-Style, corn on the cob, crabs, crawfish, creole seasoning, dinner, seafood boil, shrimp, southern cooking. Bookmark the permalink. 1 Comment. You are really pushing the seafood boat out there Chef. Beautifully done. Love the aroma pic up top.